This sterling silver Celtic necklace features a heavy open filigree design with four intertwined Trinity knots. The large teardrop shape Celtic pendant measures 3/4” wide x 1 1/2” tall, including the jump ring and the chain bail, and includes a 20" long sterling silver chain. The Fáilte Collection from Solvar features heavier sterling silver Celtic jewelry. 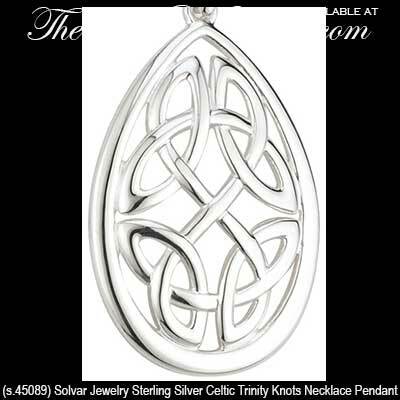 Sterling silver Celtic necklace features multiple Trinity knots in an open filigree design. Celtic necklace is a large sterling silver design that features four intertwined Trinity knots and it is enhanced with a CZ stone studded edge. 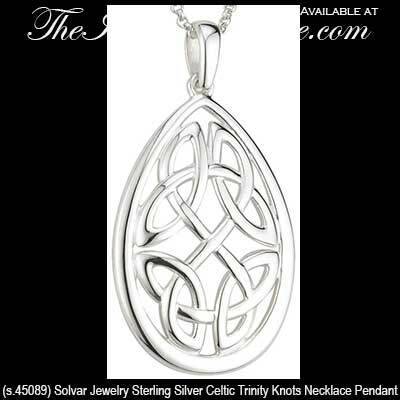 Celtic necklace is a heavy sterling silver design that features four Trinity knots inside of its oval border. Celtic necklace in sterling silver has an intricate knot-work motif with CZ stones that is called the Dara knot.